The Caps have outplayed and outworked the Rangers in the last three games. Having said that, the games have been incredibly tight. 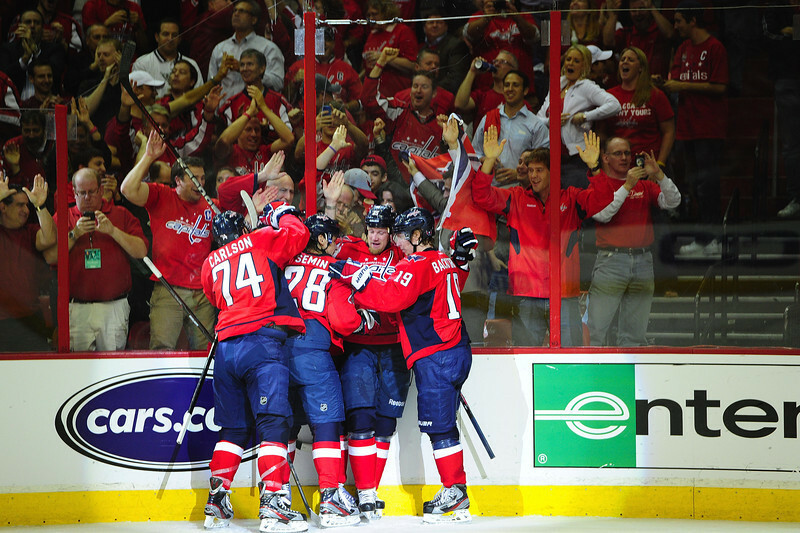 Untimely penalties and bad bounces have hurt Washington. Many opportunities were shoved wide of the net or rang off of the iron. The same can’t be said for New York. Their set plays are not materializing. They aren’t missing by inches. Their attack was stymied. Ranger shots are being sucked up in the Holtby Vortex. He leaves few rebounds and has the confidence of a more seasoned player. Caps fans remember Jim “Ace” Carey and his run as a rookie. He is the Jean Sebastien Giguere of these playoffs. Holtby has all the makings of a player who is on the streak of his life. The Caps will ride him deeper into the postseason. He will shine in game seven. Even though the Caps are being outshot there is no reason to despair. In the 1998 playoffs the Capitals made it to the finals even though they were badly outshot in nearly every game they played. Dale Hunter was captain of that team. He understands that a defense first game plan does not require a multitude of shots when the offensive chances you are getting are high quality. The Caps have been able to set up their power play and score at a higher rate than they did in the regular season (just over 18% compared to just over 16%.) Conversely, the Rangers killed penalties much better in the regular season (just over 86% compared to just over 82%.) This speaks to the overall disparity in skill level. The Caps have a much more highly skilled team. Troy Brouwer, Jason Chimera, Brooks Laich, Joel Ward, Keith Aucoin and Matt Hendricks are grinding their guts out. They have matched or bettered their counterparts in the past three games. Alzner and Carlson have played excellent defense. They will amp their play up another notch at MSG on Saturday. Alexander Semin could be the hero or the goat. He could net a goal or take a bad stick penalty. Either is as likely. In a series so tightly contested his play could be the tipping point. I say he is a hero Saturday and he pots one. Mike Green has an opportunity to step up and fulfill his potential. It seems like a lot of time has passed since his name was in the conversation concerning the Norris trophy. Injuries have plagued his career and cut his playing time short. It’s time to step up, sneak in and roof one from the back side like he did on a regular basis not so long ago. Backstrom and Ovechkin have been playing well the entire postseason. If one or two bounces go Ovie’s way, I see goals pouring in like rain. No one can say that Ovechkin doesn’t care about team. His play and leadership proves he is all about winning, even if that means letting the grinders have more ice time. The Caps win because they have outplayed the Rangers to this point. They have the momentum. They have the hot goalie. They have had the better opportunities. They have the better players. They only need to avoid stick infractions and have one or two bounces go their way to win by two or more goals.